Spoilers for those who don’t know much about history. 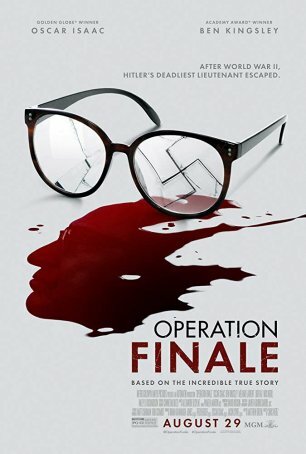 Operating Finale is an historically-based thriller that follows a group of Nazi hunters as they identify, stalk, capture, and debrief Adolf Eichmann (Ben Kingsley) in Argentina during 1960. Eichmann, one of the top Nazis to be captured post-Nuremberg, was eventually tried in Israel in what became a worldwide media event, convicted of crimes against humanity, and executed. The movie, which is concerned primarily with the several weeks surrounding Eichmann’s capture, mixes factual elements with a few “Hollywood touches” to provide a compelling thriller. The central element of Operation Finale is the psychological cat-and-mouse game between the wily Eichmann and one of his captors, Peter Malkin (Oscar Isaac). Sometimes deemed unreliable by his cohorts because of his tendency toward impulsivity and violence, Malkin is in the hunt because the Nazis executed his beloved sister and her children. His standoff with Eichmann involves no threats or brutality. Instead, he seeks to disarm the older man by appearing to let down his own guard. He offers cigarettes and wine instead of bright lights and blindfolds. With time running out as the Mossad “safe house” becomes subject to discovery by those searching for the missing SS-Obersturmbannführer, Malkin seeks to persuade Eichmann to sign a paper deemed mandatory by El Al to allow him on board a departing flight. The movie also includes traditional thriller elements such as “nick of time” escapes. Director Chris Weitz avoids overt melodrama in his depictions of Holocaust images and various flashbacks that depict some of the horrors of the second World War. He is able to get the point across without resorting to graphic scenes. (The film received a PG-13 rating.) This is important because it allows the narrative to be taken seriously and doesn’t turn Operation Finale into a routine good-versus-evil Nazi thriller. There’s no doubting that Eichmann is deserving of his eventual fate but the film doesn’t turn him into a frothing, over-the-top villain. He is presented as a somewhat underwhelming man who feels neither guilt nor remorse for the activities in which he was involved. The movie is at its strongest when depicting the psychological elements about how the characters cope with being in such close proximity to an oh-so-ordinary monster. At times, the conventional thriller elements feel grafted-on, a concession to audiences that want a little action. (There’s also a romance of sorts, although it’s so low-key that it’s easy to miss or ignore.) Overall, Operation Finale tells its story without grossly distorting history and does so in a manner that engages an audience for its two hour running time.